Trinity Designs: Stamping 411 Saturday Sketch Challenge - Sugared Treats! Stamping 411 Saturday Sketch Challenge - Sugared Treats! Do you ever stamp while you are talking on the phone? I don't do it often, but after finishing this card the other day, I'm thinking that I should. As you can see, I flipped it and made it work for my design. Perfectly ok to do! I'd been working with the Candy Cane Lane suite of products a lot lately and still had the candy cane patterned paper out. 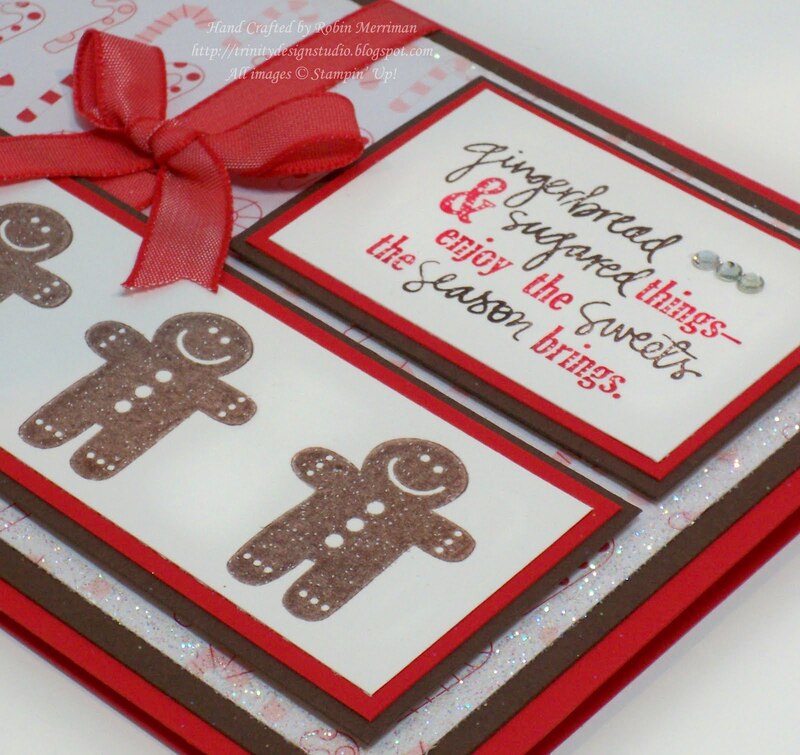 I wondered how the little gingerbread man from the Got Treats stamp set would look with that paper and voila - a card was born! Ha! 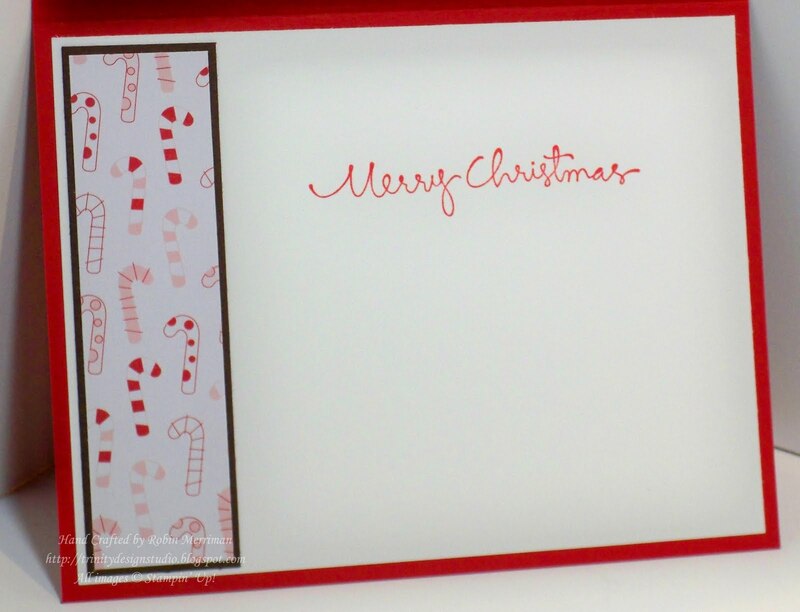 It's pretty straightforward, Real Red, Chocolate Chip and Whisper White cardstock along with the Candy Cane Lane Designer paper - love the brown tones with this! I inked my stamp with Chocolate Chip Craft ink and heat embossed each one with Clear Embossing Powder and my heat tool. It's hard to see in the photo, but they are adorably shiny and yummy looking! I inked the greeting from Sweet Season with Stampin' Write Markers and stamped it on textured cardstock for a little contrast. Of course, everything is popped up on dimensionals and I added that yummy Real Red Taffeta Ribbon and a few Rhinestone Jewels for sparkle. I had to decorate the inside too - more of that fun dsp! 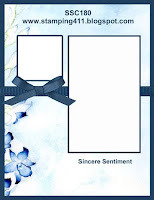 Be sure to visit the Stamping 411 Blog to see what the other Operators have created for you this week - I know you'll be treated to a feast for your eyes! This is just the cutest Robin!!! Robin- this card is really cute! Love the DSP and the gingerbread men! Flipping the sketch was genious- TFS! Oh I am SOOO case-ing that sparkly edge!!! Love it! Just brings a smile to my face! I love your use of color and the sketch! Love this! I just bought this stamp set too! The flipped sketch works perfectly with those adorable gingerbreadmen! Oh...yummy Gingerbread men! What a great card! Too stinkin' cute!! I love that pattern and those gingerbread men are too stinkin' yummy looking!! !